This podcast features a panel of subject matter experts, including Child Care Aware® of America staff Andrew Roszak, Child Care Aware® of Kansas Executive Director Leadell Ediger, and the immediate past deputy director of FEMA, Richard Serino. The podcast and accompanying article, “Legislation Protecting Children in Disasters” can be found on the website: https://www.domesticpreparedness.com/healthcare/legislation-protecting-children-in-disasters/. This free app helps parents and child care providers learn what to do to help kids cope before, during, and after 10 disaster types. It is available for Android and Apple devices. Download it for free from Google Play and iTunes. 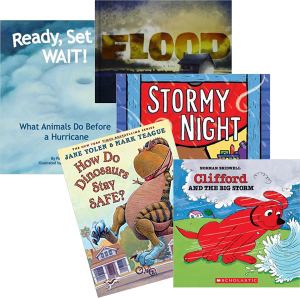 Natural disasters can be scary topics for young children, but reading together about these events in books is a great (and less-frightening) way to discuss them. And, it allows for great conversations about what to do if one occurs. “Disaster” and “emergency” are two scary words for parents. The thought of our children experiencing either situation is enough to make us want to ignore the subject entirely. But since children are among the most vulnerable when disaster strikes, it’s imperative that families take a few important steps to ensure they are prepared. Save the Children® has developed three simple prep steps and a fun dance to help children understand and be prepared for emergencies. The Center on the Social and Emotional Foundations for Early Learning has assembled a book list for children covering topics such as friendship and relationships, feelings, problem solving, behavior, and grief and death. Thanks to Primrose Schools for gathering child emergency preparedness information in one location.